ITER sequences the first 10 complete human genomes – ITER – Instituto Tecnológico y de Energías Renovables, S.A. The Genomics Area´s laboratory of ITER has succeeded in sequencing 10 complete human genome tests, i.e., determining the base sequence that make up human DNA. After acquiring two massive DNA sequencers in September 2016 to the U.S. multinational Illumina for one million euros, development of experimental and bioinformatics protocols are going at a good pace. 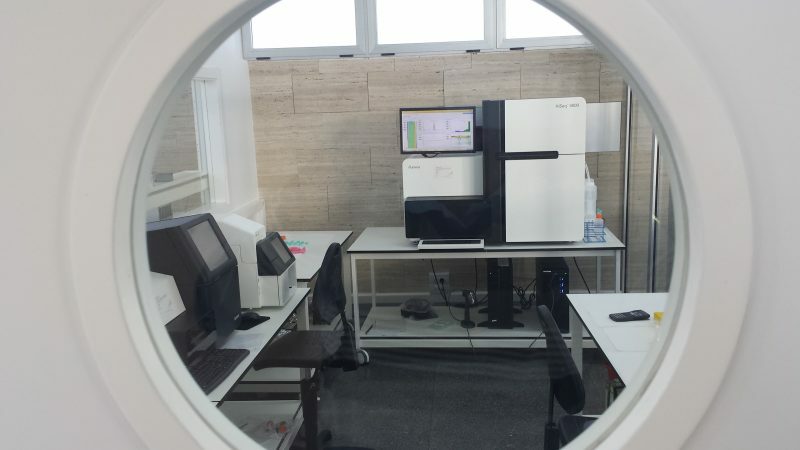 The sequencing of the first complete genomes, used as quality controls, is allowing the final tune of the instrumentation and the experimental and analysis protocols. The multidisciplinary team of the Institute, made up by the researchers José Miguel Lorenzo Salazar, Rafaela González Montelongo and Ana Díaz de Usera, in collaboration with the group of the University Hospital Ntra. Sra. de Candelaria led by Dr. Carlos Flores, focuses now in developing several experimental and bioinformatics protocols in order to increase the potential applications of this technology. On February, ITER will carry out tests to determine the genetic variation in the exome, applying different techniques to measure the versatility of the equipment purchased. After the summer, the mass DNA sequencing in any of the applications which ITER already is working in is expected to bring the opportunity to start several research projects which have started to forge in collaboration with national and international entities. The first results of ITER´s new research Area will be presented at an international forum in May, during the next Conference of the American Thoracic Society in Washington D.C. (United States), which will bring together the results of several studies about the influence of genetics in idiopathic pulmonary fibrosis surviving patients, where ITER and the working team of the University Hospital Ntra. Sra. de Candelaria have participated in collaboration with researchers of the universities of Chicago and Davis in California, United States, and of the University of Leicester, in England. The exome is the part of the genome formed by the exons of all genes. It, therefore, includes the coding regions that will constitute the mature RNA, which after the transcribing process within the cell, will make proteins that will develop their functions in the organism. Hence, the study of the exome can be of interest for the study of simple and complex genetic based diseases, where there is not an identified gene to carry out diagnosis studies. The procedure is complex, but its automation can help. The equipment acquired break, as in a puzzle, human DNA from blood or saliva, in thousands of pieces. Each piece is sequenced hundreds of times and then the puzzle is reassembled by the high performance computer Teide-HPC. Real image of a moment of the complete genome sequencing performed by ITER in December 2016. The image shows a small region of the flow cell (left). The light spots (right) correspond to the flourescence emission that takes place during the incorporation of nucleotides in a a complementary way to the DNA fragments in a particular cycle of the sequencing. The advantages that mass DNA sequencing offers to health care are potentially huge. The genomic research implies a breakthrough in prevention, now that its application can mean treatment adaptation and better diagnosis. An example of a practical case of application of this technology affects the field of the assisted reproduction, now that it permits an evaluation of the embryonal cells in those people that are certain about carrying a disease, in order to choose and implant those that are free of it. Another possible application in the reproduction scope is to substitute the amniocentesis test for a normal peripheral blood test to the mother, now that one of the applications is the detection of chromosomal problems. Due to the experimental complexity and the dimension of the information obtained (Big Data), ITER has not considered giving an individualized service on demand. It is not recommended that a citizen without the proper training interprets its own genome information. This cutting-edge technology requires health professionals to work hand on hand with researchers that use the information generated to interpret the results adequately. For this reason, ITER considers establishing synergies directly with the administration and entities, both public and private, in direct collaboration with the health professionals, to foster a Personalized Medicine in the Canary Islands.